A QA team today faces many new challenges related to faster project deliveries, higher user expectations, rapidly changing technologies and support around-the-clock. The role of the QA team is no longer to simply ensure that the product is delivered defect-free. Of course, that is a given, but today, QA must also support the organization’s strategic business goals and deliver business value through software testing practices. We call this Business Value QA. What can a QA team do to deliver business value? The QA team needs to understand the business process that a particular application supports. This helps them to identify which defects are critical, and design the most suitable testing methodologies. Tests can also be designed based on the criticality of business needs, thus optimizing QA efforts. Keeping the end-user’s perspective in mind enables the QA team to follow those software testing best practices that ensure the best user experience. It has now become more relevant to measure and monitor the business benefits of the Quality Assurance methods and practices, rather than just monitoring testing metrics. This helps to further improve the QA practices and make them more mature. How do Business Value QA projects differ from traditional QA projects? Traditionally, QA projects were designed from the QA team’s perspective. Now, the business function’s perspective is the centre of focus. This means a change from testing functional requirements to business requirements. Traditionally, QA would detect defects, but had no way to predict their future occurrence. In business value QA projects, analytics are used to predict possible defects. In Business Value QA, the objective is to prevent defects from occurring. In the traditional approach, testing plans were created so as to achieve the maximum test coverage. 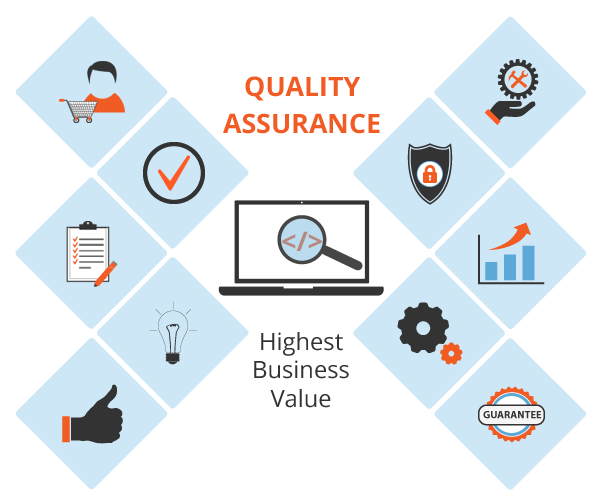 However, in Business Value QA projects, risk based testing is used to achieve the maximum coverage in the most optimal time. Metrics to determine the effectiveness of the QA are related to the business and not just the testing function. Traditionally, QA service providers would work on a fixed price or time-based model, but with Business Value QA, the service provider may work as a partner and price based on defined outcomes. Focus on faster go-to-market by eliminating inefficiencies and delays in the system. Validation early in the lifecycle can ensure that business requirements are fulfilled at the system level, before integration of the whole. This reduces testing costs as defects are identified earlier. Planning for automation at the design stage helps to get a better ROI. Reuse Artefacts from a previous release in regression testing can be reused to improve productivity. Advanced techniques The use of techniques such as risk-based testing, intelligent test data management and defect prediction leads to better test coverage and productivity. An organization can gain from the Business Value delivered by the QA function if all stakeholders understand the business perspective, and there is open communication at all stages. The gains are tremendous and include better product quality, faster project deliveries and optimized testing efforts. There is a need for testing practices to evolve into more matured ones that deliver real Business Value.